Support your colleagues and they will support you was just one of the lessons learned by the nurses involved in this fascinating project. Can you measure and teach compassion? The publication of Compassion in Practice, the chief nursing officer for England’s vision for nursing and midwifery staff, prompted a group of colleagues to try – and based on our results, I would say that you can. In 2013, we adapted a staff survey for nurses, healthcare assistants (HCAs) and midwives at Whittington Health, an integrated NHS care provider in north London, to ask what they thought compassion was, and how it was practised. Most descriptions and examples given suggested staff thought that compassion was emotionally intelligent communication, driven by a motivation to help the patient. Some thought you should be equally compassionate to all patients all of the time, whereas others thought it was about noticing when a patient was in acute distress and responding accordingly. From these responses, we built a visual model of compassion, which we presented to focus groups of nurses, HCAs and midwives. When asked what they thought got in the way of their compassion, they gave a wide range of honest and courageous answers, including working in unsupportive, unfriendly environments and temporary, unstable teams; judgemental thinking about patients and service users; being caught up with their own personal thoughts and feelings; and being frustrated at being moved to another ward part way through a shift or because equipment was not working. A common belief was that some staff simply ‘didn’t have it’. An audit tool to assess the compassion of staff was then developed from the visual model. Staff were observed in practice, and we were pleased when the results showed that a high proportion of front line staff demonstrated high levels of compassionate care. Knowing some of the obstacles, it is important that healthcare managers and leaders are aware of the effect these can have on the compassion of staff, and work to remove them. Providing strong clinical leadership, and ensuring an effective model of staff support is in place, such as Schwartz rounds, certainly helps towards this goal. Although many of the obstacles to compassion are personal and specific to the staff member, skills can be learned to help individuals better manage difficult thoughts and feelings. These include mindfulness techniques and acceptance and commitment training, which also improve personal resilience and enable staff to better manage the challenges of modern healthcare. The compassion model developed at Whittington Health generated a lot of interest and was presented widely both within and outside the organisation, including at international conferences. To share our insights and evidence-based practice in this field with a wider audience, and funded by a Health Education England award, we collaborated with a community employer and local university to host a free conference. Compassionate Healthcare: How to Support and Enhance It was held in March this year (a highlights video is at youtu.be/ZkfLPZijPuE). Keynote speakers with health backgrounds and specialist speakers including lecturers, psychologists and researchers in compassionate care, addressed 150 professionals from ours and other organisations. The most popular speakers told patients’ stories of healthcare experiences, some of which were expressed in their own poetry, which was moving. 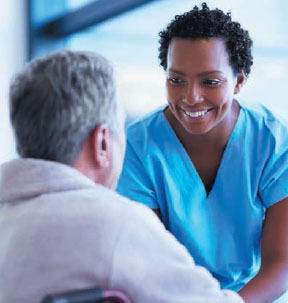 This demonstrated the power in patients relating their experiences to healthcare staff away from the clinical area and after their healthcare experience – where it becomes more about one person communicating to another than about the sometimes imbalanced nurse-patient dynamic. The response to the day, especially the patient stories, was overwhelmingly positive. Nurses said that always listening to the patient is at the core of compassionate care, but they recognised the importance of being compassionate to themselves, and how this can enhance their compassion for other people. Inefficiencies outside the clinical area affect compassion within it. It is clear that nursing staff are receptive and ready for education, training and development opportunities that help them to show compassion for service users in challenging circumstances. It is vital that all healthcare organisations provide ongoing staff support and training. If compassion features commonly in organisational values, why are activities to support and enhance it not part of mandatory training? Healthcare organisations need to ensure that these opportunities are provided, supported and seen as essential to delivering truly compassionate care.